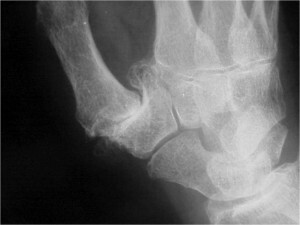 Pain at the wrist and base of the hand is a common symptom of osteoarthritis. 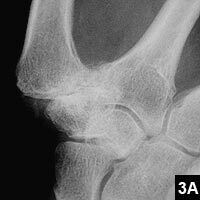 This form of arthritis results from gradual wearing down of the cartilage within joints and eventually leads to pain in those joints as the bones begin touching and rubbing together. When osteoarthritis involves the thumb it can become quite debilitating and prevent using the hand for many activities. Arthritis in the thumb can be the result of trauma or fractures or can be a gradual process that happens over time. In the early phases pain may be helped by physiotherapy and splinting or by medications such as anti-inflammatories, fish oil or chondroitin sulphate. As the arthritis progresses and more cartilage is worn away, the pain becomes less responsive to medications and has a greater effect on your daily life. In the more advanced stages then surgery is able to provide good relief from the symptoms of pain and stiffness. Your surgeon will carefully assess your hands and examine your x-rays and discuss the most appropriate form of surgery to relieve your pain. Trapeziectomy – This is the most widely performed operation for relieving pain from thumb base arthritis. 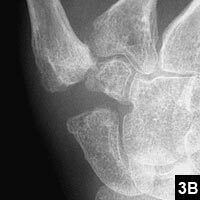 It involves removing the small bone at the base of the thumb that is rubbing against the main thumb bone. A substitute is then formed from your own tissues to take the place of the removed bone. This iis a good reliable option for relieving pain from thumb base arthritis. Joint replacement – In a limited number of patients with high demands on their hands it may be worth considering replacement of the thumb base joint with an artificial joint prosthesis. There are a number of artificial joints available on the market and which is most suitable for your particular hand will be discussed with you at your appointment. Recovery after surgery will involve wearing a cast or splint to support the thumb through the healing process. While in the splint the hand is able to be used for light activities. The duration that the splint must be worn for varies depending on which operation you have had but is usually around 6 weeks from the time of operation. There are many causes of pain about the wrist and base of the thumb. If your pain is caused by arthritis at the thumb basal joint then the options described above give good reliable relief to that pain while maintaining function and movement of the thumb and use of the hand.